Rent Out or Sell Your Home? Have you ever wondered whether it would be a good idea to rent out your home instead of selling when it’s time to move? Most of our clients are investment-minded, and we love the notion of keeping your current home as a rental when you move out of the area or buy a bigger home. How do you know if you’re making the right decision? We give you all the information you need to consider in our four-part series, How to Be a Landlord. This week’s installment is part one and discusses some important questions you need to address to see if renting out your home works for you and your finances. Are you on automatic pilot when it comes to selling your home? Rather than fast-forward to putting that “for sale” sign out, have you ever thought about keeping your current home as a rental? Maybe you’re ready to move up to a house but can’t see giving up your first home because it’s in a great location where renters could cover your mortgage. Or you need to relocate but hope to move back in a few years. What are the market conditions for rentals and homes for sale in your neighborhood? You need numbers, and by doing a comparative market analysis (work with an agent or do you own legwork online) you’ll be able to gauge how both markets are doing now and trending into the future. You can see if the demand for rentals is strong and how much rent you could charge for a home such as yours. Condos, townhouses and single-family homes can vary in the rental market. On the flip side, you can determine how much homes similar to yours are selling for and how long they stay on the market. If prices and property values are rising, you might want to rent so your home can continue to appreciate. If property values are declining, you might want to sell before you lose any profit OR wait it out in the hopes that the market will turn around down the road. The best place to start is to know what your potential income would look like. Our next step then is to look at the expenses you need to consider. What expenses do you anticipate when you rent your home compared to any potential profit? Continuing to own your home as a rental still means you need to pay your monthly mortgage, real estate taxes, homeowner’s or rental insurance, and handle any homeowner’s association dues or costs of a property management company (if you hire one). Plus, you want to have an emergency fund for any unexpected costs if something breaks. You also need to build in a buffer if your tenant doesn’t pay or you need a month or two between renters. And don’t forget to factor in any costs you may incur when preparing your property (paint, reasonable upgrades, getting it to meet certain codes). You don’t need to go overboard but you do want to attract tenants that you hope will be good renters. Compare these expenses to the income you will make renting out your home and determine if you’ll make a profit or break even. Keep in mind you’ll have to pay taxes on this income but can offset it by taking deductions on some of your expenses for the rental. Now that you know the potential income and expenses associated with renting your home, you’ll be able to determine whether or not keeping your current home as an investment makes sense over the short-term. But what about the long-term outlook? Does renting or selling fit in better with your future financial plans? Several factors could come into play when taking into account your financial outlook. If you’re underwater on your home, you might consider renting to wait for it to appreciate in value. Or if you bought your home at a good time and expenses are low, you may want to turn it into an investment property once you move. Will you be stretching yourself by owning two homes, especially if you anticipate costs for renovating or upgrading the home you live in with your family? Will renting be a financial bonus or burden if you expect to be writing some large checks in the near future, such as paying for private school or college for your kids? It’s important to talk to your tax advisor or financial planner if you plan to rent. Does postponing a sale make financial sense for you? They can help determine if forgoing any tax breaks for capital gains is something to consider when you turn your home into an investment property. You need to live in your home for at least two out of the past five years to be eligible for this tax break when you do sell your home. Do you need the proceeds from your current home to buy your new home? This is a biggie! If keeping your current home as a rental impedes on your ability to buy your next home, then definitely sell. No question at all. That means if you can buy the home of your dreams only if you sell your current property, then you absolutely should sell it. Only think about renting if you don’t need the cash out of your current home to buy your next home. This may be a simple question but it’s one of the most essential ones. Being a landlord is not always easy and comes with responsibility along with challenges. You’ll need to weigh the emotional and time costs against any potential profit. You’ll be dealing with tenants and never know for sure what to expect even when you do a background check! If “strangers” will be living in your home, you need to be prepared for it to have some wear and tear and not have complete control over visitors and other activities, etc. It’s also a time commitment when you’re a landlord. That’s something to keep in mind whether you live nearby, out of state, or just travel a lot for your job. If you don’t hire a property management company, then you’ll be the one getting those calls if the water heater breaks or the toilet needs fixing. Plus, annual upkeep and property checks will be your responsibility. Most importantly, you will need to understand your state’s tenant rights laws and landlord requirements. You want to be ready for whatever comes your way. For example, what happens if your tenants can’t make a rent payment or don’t follow certain agreed upon rules? Can you evict them? Are you truly ready for this responsibility? 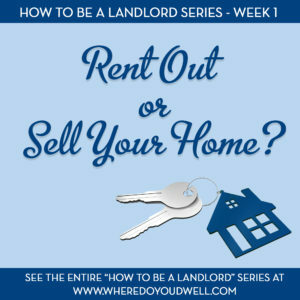 We are excited to bring you our four-part How to Be a Landlord Series. Next week’s article, Decided to Rent Out Your Place? Now What?, covers what needs to be done in order to rent out your home. Stay tuned!